Coupon Network has a high-value Cheerios coupon. Head over there and click on the +$0.30 green link and watch a short video to get a coupon for $1.10/1 Multi Grain Cheerios Peanut Butter cereal. 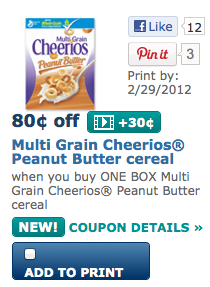 There is also a $1.10/1 Multi Grain Cheerios Peanut Butter cereal coupon on Coupons.com this morning. Make sure to print it twice.